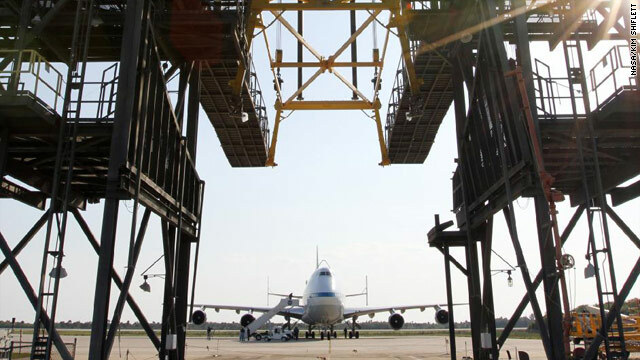 "The newly arrived Shuttle Carrier Aircraft is seen through the platforms of the mate-demate device at the Shuttle Landing Facility at NASA’s Kennedy Space Center in Florida. The aircraft, known as an SCA, arrived at 5:35 p.m. EDT on Tuesday, April 10, 2012, to prepare for shuttle Discovery’s ferry flight to the Washington Dulles International Airport in Sterling, Va., on April 17. This SCA, designated NASA 905, is a modified Boeing 747 jet airliner, originally manufactured for commercial use. One of two SCAs employed over the course of the Space Shuttle Program, NASA 905 is assigned to the remaining ferry missions, delivering the shuttles to their permanent public display sites. NASA 911 was decommissioned at the NASA Dryden Flight Research Center in California in February. Discovery will be placed on permanent public display in the Smithsonian's National Air and Space Museum Steven F. Udvar-Hazy Center in Chantilly, Va."